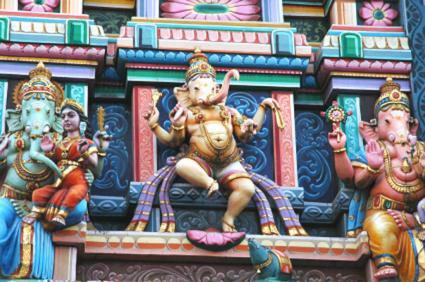 There is much debate over the question, "Are yoga poses based on Hindu gods?" The short answer is not exactly. However, the more advanced the practice, the greater the variety of asanas, and a few postures do reference some deities and sages. Here is a brief overview of this complex topic. Since the majority of yoga asanas have Indian Sanskrit names, it's easy for someone to be intimidated by the language barrier and question the meaning of the postures. But in reality, ancient yogis drew inspiration from the world around them. Therefore, most yoga poses were named by referencing animals or things in nature. Some believe that several thousand years ago, yoga was a practice of postures dedicated to Hindu gods. And within this practice, there's the opportunity to achieve a higher state of consciousness and thus, a spiritual connection to those gods. There are some styles of yoga that have a stronger spiritual purpose than others. Just as there are numerous interpretations of the Bible, the Koran, the Torah and so on, there are multiple theories regarding the purpose of yoga. For those who believe that yoga is a form of worship to gods not held in their faith, they think yoga is a method of homage to false idols. Some also consider yoga to be an extension of the New Age movement, and thus in direct defiance of traditional faith. Yet, similarities exist. For example, some people have compared meditation with yoga mala beads to reciting prayers with a Catholic rosary. Yoga teachers of the 20th century have stressed that the point of the basic yogic principles is to enrich an individual's life and spirituality, regardless of what the person's faith might be. Each of us is on a unique journey. While yoga may help some people achieve greater awareness and connection, others may simply be stretching. Are Yoga Poses Based on Hindu Gods? Richard Rosen is the director of the Piedmont Yoga Studio in Oakland, California, and a frequent contributor to Yoga Journal. He wrote a paper about the origin of yoga poses based on his years of studying and researching traditional yoga texts. Interestingly, he developed a percentage system to analyze postures and their namesakes. The remaining postures are primarily named after yoga teachers, and one deity, Bhairava, also known as Shiva, and his son, Virabhadra. Rosen points out that many of these names did not appear in the ancient texts, but in 20th century yoga books.